I’ve been thinking about the summer day I drove to Shrewsbury to interview Senator James M. Jeffords for Vermont Magazine. 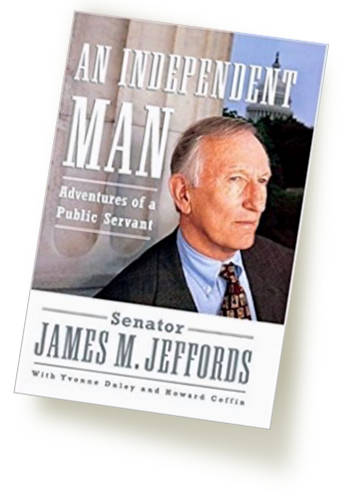 Jeffords had just weeks before given up the longest-held Republican seat in the U.S. Senate, simultaneously returning Senate control to the Democrats and in so doing becoming if briefly a household name. 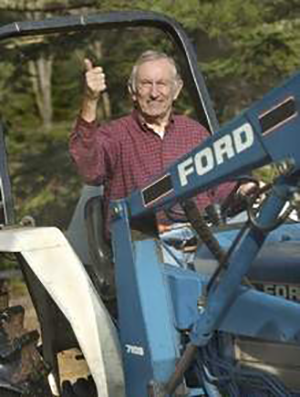 I found him perched upon an old Ford tractor, his hair awry, and a goofy grin spreading across his face as he waved my way. He was mowing his overgrown meadow, as oblivious to the slight trickle of blood on his forehead, the result of absentmindedly driving into a branch, as he was to the messages clogging his answering machine. Later, we talked in the comfy house he and his wife Liz Daley (no relation to me) called home. Jeffords took the chair that had been literally shredded by the family cat. One minute he was joking to Liz not to dare throw the tattered thing out and the next describing the clarity he experienced when he was in Vermont. He explained that he had waited to make the announcement to become an Independent here rather than in D.C. because Vermont and Vermonters always reminded him of what mattered most: personal integrity. Due to his overnight fame, Jeffords had been offered a two-book contract from Simon & Schuster. Staff members, especially Mark Powden, had essentially written the first, entitled “My Declaration of Independence.” Jeffords thought he could write the second, a reflective biography of his political life, by himself. By the end of his first “writing lesson,” however, it was clear that, while he had made quite a scene with his defection, he needed more than advice on how to create one on the page. For the next eight months, Jeffords and I spent what sometimes felt like a lifetime together as we worked on An Independent Man, the biography published in 2003. That summer and over the winter holiday, we worked through breakfast and lunch at my kitchen table in Rutland. I made the mistake of asking his favorite sandwich: peanut butter, lettuce and mayonnaise. When he left at 4 p.m. to meet Liz, who was undergoing chemotherapy at the Rutland hospital, I’d spend the night reading the most incredibly boring documents called legislative journals, which are essentially the record of each congressman or senator’s daily activities, and prepare questions for the next day. Other nights, until my eyes glazed over, I’d go to my former employer, the Rutland Herald, and pore through articles I and others had written over the decades, clarifying dates, noting the highlights of a politician’s long career and his personal challenges. Early on, it became apparent that Vermont would not be the place it is today without Jeffords. Credit him with no billboards, some of the nation’s first and most progressive environmental regulations, a cleaner Lake Champlain and healthier family farms. As a journalist, I knew about these efforts, but I had little appreciation of the personal dramas that accompanied these David and Goliath battles he’d waged on the state’s behalf against such giants as International Paper over Lake Champlain or the beverage industry over Vermont’s banning of certain non-returnable bottles until I dove into the details. That fall and winter, after I returned to my job at San Francisco State University and he to Washington, I’d fly each weekend to D.C., where we’d work in his little hideaway office at the bottom of the Senate building. Much larger events had eclipsed what turned out to be Jeffords’ small rearrangement of the political landscape. 9/11 had happened. Jeffords’ fellow Vermont Senator Patrick Leahy had been the target of one of the anthrax-contaminated letters. Every plane trip was rife with paranoia. Washington felt like a place under siege with cement barricades everywhere, non-essential government buildings closed to the public, and security guards and x-ray machines at the entrance to the Hart Senate Office Building. Jeffords may have been the darling of the Democrats but he was persona non grata among Republicans. It was the confidential report of his investigation (along with Democratic Senator Terry Sanford of North Carolina) into whether Reagan and his campaign committee had orchestrated the late release of the Iran hostages in order to defeat President Carter in the 1980 election. The hostages had for 10 years been demanding such an inquiry. One of the more disturbing questions was whether or not George H. W. Bush, then Reagan’s running mate, had participated in these efforts. Now Bush was president and the hostages had brought their request to the Senate subcommittee on Near Eastern and South Asian Affairs, which Jeffords chaired. His fellow Republicans were dead set against the investigation. The Senate denied Jeffords’ request for subpoena powers and refused special funds for such an investigation. But Jeffords went forward anyhow, using the limited resources of his sub-committee. The inquiry soon became mired in stories of intrigue and acts of obfuscation as FBI videos of suspect arms dealers who claimed to have planned an arms-for-hostages deal with Bush and Reagan’s campaign director William J. Casey went missing and most of the major players, including Casey, had died. In the book, Jeffords is particularly forthcoming about his own failings, especially in regard to his outspoken and rather liberal wife, and the struggles that she had with alcohol and prescription drugs. He was able to put their personal struggles in perspective with the women’s movement and the confounding affect it had on men who had grown up in a different era. As with his marriage, Jeffords either just didn’t get or wouldn’t accept the growing distance between his fellow Republicans and himself. Most pundits believe it all came to a head during budget talks shortly after President George W. Bush’s election. Jeffords just could not understand why in a time of huge surpluses, Bush’s tax cuts for the wealthy had to come with a substantial reduction in education aid to children with disabilities, a cause Jeffords supported throughout his political career. He tried unsuccessfully to negotiate the issue but in the end voted in favor of an amendment by Sen. Tom Harkin (D-Iowa) to reduce Bush’s tax cut by $450 billion and divide the money between education and debt reduction. By then, it was clear that reconciliation was impossible for Jeffords and the party he had grown up in. “I sometimes think about our young people and wonder how they feel about our political process and their place in it. After fifty years of assassinations, Watergate, and so many other scandals, and the contentious race for president in the last election, it would not be unreasonable to be jaded about democracy and public service. Indeed, I worry that our best and brightest youngsters are already turned off to the concept of public service. As a writer working on my first book, and a long and complicated one, I learned valuable skills about organization, short-cuts that made fact-checking less onerous, and tools for eliminating repetition. I also learned to be clear with editors about structure and authority. The most important and inciteful sections of the book come towards the end with longer chapters with details about Jeffords’ early life in the early chapters. I argued for a rearrangement of the material to no avail. That said, it’s a fascinating and remarkably honest biography of a career politician, one I’m proud to have brought to fruition, one that honors a man with integrity.